The eastern meadowlark and bobolink are pretty migratory songbirds that respectively sound flutelike – and a little like R2-D2. They are also threatened species in Ontario. Now Wilfrid Laurier University Associate Professor Colin Robertson and his Geography master’s student Lauren Yee have partnered with the Ontario Soil and Crop Improvement Association (OSCIA) to enlist farmers to help protect them. 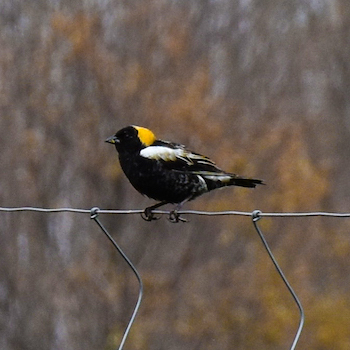 Robertson and Yee have developed a citizen science program called GrassLander, a web-mapping platform through which farmers can record sightings of the bobolink and eastern meadowlark. In this way, farmers can contribute valuable data that would otherwise be hard to gather. Bobolink and eastern meadowlark nest in grasslands – and these days, the most common places to find tall grasses are on farms. Both bird species build their nests on the ground and hide them well in dense vegetation, which is an effective strategy for hiding from predators but makes them vulnerable to agricultural activities such as haying. In particular, cutting hay during the birds’ breeding or hatching periods can destroy nests, eggs and baby birds. Therefore, the GrassLander project aims not only to collect data but also to educate farmers and change some of their practices. “In some cases, if farmers delay their haying by about a month, the birds will have fledged and they’ll have a much better chance of survival,” says Yee. OSCIA originally conceived of a citizen science project as a way of promoting the protection of at-risk species on farms. The organization contacted Robertson, who had gained some renown for his involvement in the RinkWatch project, which asks people to submit information about conditions on outdoor skating rinks. In addition to partnering with OSCIA, Robertson recruited Yee, along with Esri Canada, a geographic information system company, and University of Waterloo geographer Rob Feick. The Ontario Ministry of Natural Resources and Forestry and the Mitacs Accelerate Program provided funding. To participate in the project, farmers set up a detailed farm profile using the online maps. They can then report not only bird observations but also relevant agricultural practices, such as when they move livestock or cut hay. All the data collected is secure, with no identifiable information visible even to other farmers who sign up for the project. The mapping platform is accessible both on computers and on mobile devices. The team launched the prototype phase of the project last summer with eight participating farmers but is now working on a major expansion across Southern Ontario, where the two bird species live in the summer. Robertson hopes the project expands year over year, perhaps eventually to include the monitoring of other wildlife that use agricultural landscapes. The project has no specific end date. Yee has been working as a research assistant since last summer, when she did a Mitacs internship to help kick off the project. She says she has learned a great deal from participating in GrassLander. “I’ve extended my skills with web development and citizen science, and Dr. Robertson has been a great supervisor – really supportive and always helping me get opportunities and learn new skills,” she says. Both Yee and Robertson say working with farmers has been meaningful and enlightening.